The Rockwell/Collins advertisements for the KWM-380 contain a nostalgic scene with some S/Line gear. It makes for a nice advertisement display, but no one should imagine that the KWM-380 has anything in common with the old S/Line gear except a bit of nostalgia. The KWM-380 is a completely new transceiver concept from the ground up. The KWM-380 h.f. transceiver makes quite an impression when one first receives it as I did in a rather huge package. Unpacking it, one finds a unit that measures about 16 " X 18" X 7 " and weighs in at almost 50 Lbs. For its power class as a nominal 100 watt output transceiver, it is several times larger and/or heavier than quite a few transceivers on the market, although one should note that it is a complete station package. That is, it contains a speaker, power supply, the equivalent of a second v.f.o., and space for a host of accessory items, such as a unique type of new speech processor. The space and weight involved is not wasted. The transceiver is filled with circuitry and interesting features, as it should be for its price class. 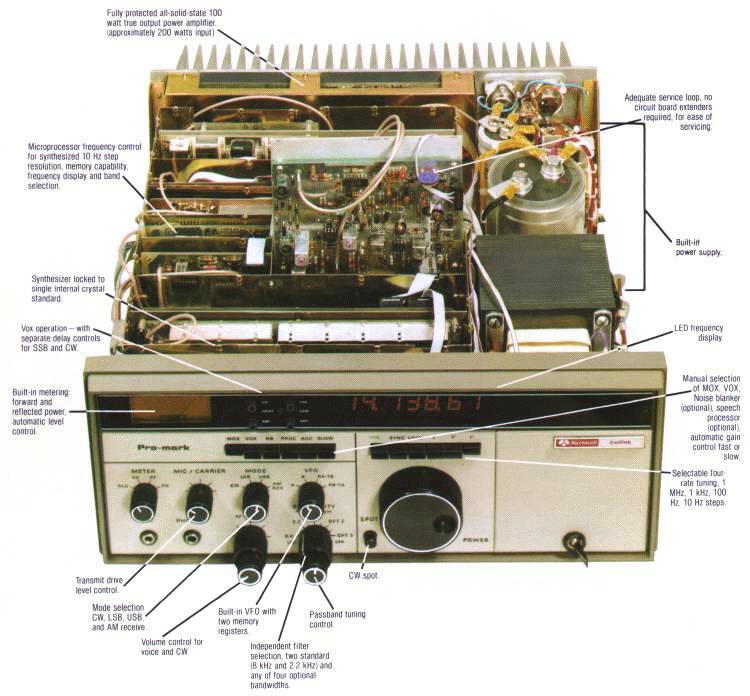 The transceiver basically covers the 1.8 to 30 MHz range in 10 Hz steps with a four-speed tuning capability on receive and nominally only the 160-10 meter amateur bands on transmit. WARC bands are provided for by a simple modification. The receive coverage is not specified in terms of "bands," because from an operating viewpoint they do not exist. The tuning coverage is truly continuous, in that, as described later in more detail, one simply rotates the tuning knob to go from 1.8 to 30 MHz. There is no bandswitch nor any receive or transmit tuning controls other than the main tuning knob. The rest of the specifications call for very "tight" frequency readout accuracy and stability, a nominal 100 watt output, very good unwanted signal suppression values on transmit, and an exceptional combination of good receive sensitivity with a +15 dBm third-order intercept point. Just reading through the specifications, one senses that the KWM- 380 should be an exceptional transceiver. The physical impact of the KWM-380 only serves to enforce this expectation - not because of its weight, but because of its exceptionally "clean" panel layout and extremely clear and large digital frequency display. As it turns out, the KWM-380 is an exceptional piece of equipment. Someone such as myself who enjoys understanding and writing about circuitry detail could probably generate several volumes on the KWM-380. However, I'll try to resist over-indulgence in that aspect of things in favor of giving you a general description of the electrical concept of the KWM-380, while highlighting a few specific circuits, some comments on the KWM-380's physical make-up, results of test measurements, operating impressions, and finally, details on a few of the most interesting accessories available for the KWM-380. inc. 25 mm (1 in.) feet; 457 mm (18.0 in.) deep. Modes                   u.s.b., l.s.b., a.m..and c.w. measurement)            s.s.b. and c.w. ; 1.0 uV or better for 1.8 to 2.0 MHz. max. Automatic turndown to 50 W after 10 seconds. 30 minutes max at 50ø C for all modes. The receive and transmit signal chains do utilize some common circuits, but if one notes the arrows on the diagram for their signal flow, one can separate them fairly well. For instance, the receive signal path starting at the antenna (upper left corner) goes through a low-pass filter and a.g.c. blocks to a first mixer stage. This mixer stage receives local frequency injection in the range of 39.145.00 to 69.144.99 MHz from a synthesizer block and produces the first i.f. output at 39.145 MHz. The 39.145 MHz i.f. signal goes through a broad 4-pole crystal filter and on to the second mixer, which produces the second i.f. frequency of 455 kHz. The i.f. frequency is translated to 6.255 MHz in a passband tuning circuit and then retranslated back to 455 kHz. The final 455 kHz signal is routed through a product detector for s.s.b./c.w. or to an a.m. detector and then on to a c.w. audio filter and the a.f. amplifier stages. The transmit signal path starts with a balanced modulator at 455 kHz (upper right of fig. 1), goes through the sideband filter associated with the 6.255 MHz passband tuning circuit, is retranslated to 455 kHz, then is up-converted to the 39.145 MHz i.f., and finally is translated in the same mixer which handles the incoming receive frequency to the output frequency. All of the frequency conversions used in the KWM-380 may seem a bit confusing, but they are designed to accomplish various specific functions. An examination of slightly more detailed receive and transmit signal path block diagrams should help to clarify the situation. The "front-end" of the KWM-380 is unique in several respects. There is no r.f. amplifier stage, and there are none of the usual bandpass filters as are usually associated even with transceivers having a "high" first i.f. (above 30 MHz). The filter blocks that an incoming signal goes through before being amplified are not quite what one would expect. The first filter block is a 0.5-1.6 MHz roll off one, simply designed to protect the transceiver from BC band overload. The high-pass filter block works in conjunction with a following 30 MHz low-pass filter block. The latter is fixed in frequency at 30 MHz, while there is a selection of three high-pass filter cutoffs of about 20,14, or 7 MHz. So, an incoming signal can be "bracketed" between 7-30 MHz, 14-30 MHz, or 20-30 MHz. The reason for this arrangement is not simply to provide image signal rejection; the very high first i.f. frequency takes care of that. The high-pass filters ensure that the transceiver does not generate second order intermodulation products of commercial/broadcasting stations. For instance, in the European area the "breakthrough" of 13-15 MHz signals on "simple" transceivers operating on 10 meters can be a very severe problem. The problem doesn't exist with the KWM- 380. In between the high and lowpass filter blocks one can see a PIN diode attenuator (CR104). This diode is controlled by a voltage from a.g.c. amplifiers in the KWM-380. Essentially, the diode performs the same function in an automatic fashion as the manual r.f. attenuator switches one finds on many h.f. transceivers. The 39.145 MHz i.f. signal is produced by the first "U100" mixer. This i.f. signal is amplified, passes through an optional noise blanker unit, and then goes on to mixer "U102," where the i.f. signal is translated to 455 kHz and routed to a passband tuning assembly. 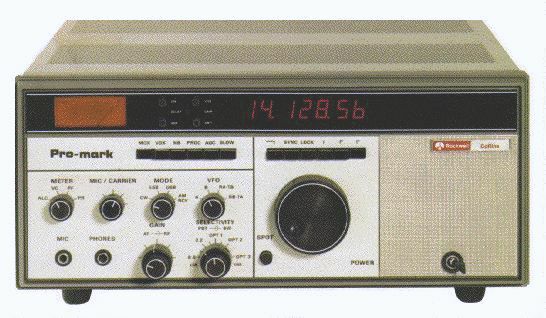 An up/down frequency translation takes place in this assembly in that the 455 kHz i.f. is translated to an i.f. of 6.255 M Hz and then back down again to 455 kHz. True signal selectivity takes place in crystal filters associated with the 6.255 MHz i.f. The final 455 kHz i.f. signal is demodulated to provide an audio output and rectified to provide the control voltage for an elaborate "hang" a.g.c. loop which controls both the incoming signal attenuation (PIN diodes between the high- pass and low-pass filter blocks) and the final 455 kHz i.f. signal attenuation (PIN diodes before the "U700" stage). The 800 Hz Spot Tone input shown in the lower left-hand corner of fig. 2 provides for a convenience feature, in that in the c.w. mode only, one can enable an 800 Hz test tone to which a received c.w. tone (centered on 800 Hz by a c.w. i.f. filter) can be matched for exact transmit/receive frequency coincidence. It would be fun to highlight in detail numerous unique circuits used in the KWM-380. However, if one has to use a practical approach by both serving potential purchasers of the KWM-380 and giving readers some circuit ideas, the following should be of special interest. The basic "front-end" of the KWM-380 is shown in fig. 3. This diagram shows in detail and with circuit values the various filter sections previously mentioned. The antenna signal first encounters the multiple-pole BC band rolloff filter shown as L800-804 and C800-801. The three high-pass filters are each composed of a similar number of components (e.g., five capacitors and two inductors). The 100 uh coils on each side of each filter are RFC's which are used for signal isolation in the PIN diode switching scheme used. When point K(7) is grounded, the filters are bypassed by diodes CR800-801. When one of the points L(7), M(7), or N(7) is grounded, one of the three filters is selected. The incoming signal then passes on to the diode section between C825-C102. This diode section is an overload protector composed of zener diodes VR100-101 and limit at the 7 volt level. C104 is switched to ground by the variable resistance of PIN diode CR104, which in turn is driven by the chain of a.g.c. amplifiers shown at the bottom of this diagram. The incoming signal then goes through the fixed 30 MHz low-pass filter and on to mixer U100. U100 is a commercial diode ring mixer (type SRA1H from Mini-Circuits Lab., Brooklyn, N.Y. 11229). The signal is, of course, then translated to the first i.f., but note that only then does signal amplification take place. The whole "front-end," so far, has been passive. The concept and practical usage of the passband tuning used in the KWM-380 is illustrated in fig. 4. The 455 kHz signal coming into mixer U4 has a bandwidth up to 8 kHz. After mixing, the resultant 6.255 MHz signal is routed to any one of five crystal filters: a standard s.s.b. filter (2.1 kHz), standard a.m. filter (8.0 kHz), an optional narrow filter for s.s.b. (1.7 kHz), or optional narrow filters for c.w. (140 or 360 kHz). One also has the option of physically substituting an optional 6.0 kHz filter for a.m. for the standard 8.0 kHz one. These filters are all switched in and out by some diode/transistor switching circuitry as controlled by the front-panel selectivity control. The 6.255 MHz signal is then retranslated to 455 kHz in mixer Q1. Since mixers U4 and Q1 have a common injection oscillator, varying the frequency of that oscillator moves the selected filter bandwidth chosen within the overall incoming 8 kHz bandwidth of the incoming 455 kHz signal. It shows the passband tuning effect as one varies the passband tuning control when a standard s.s.b. filter has been selected. Two things should be noted: the filter bandwidth does not vary as its placement is varied, and the operator must set the passband tuning control so either l.s.b. or u.s.b. signals are passed. One can note that the microprocessor control block commands a central position as regards accepting input commands from the frequency tuning controls and then sending out data to various blocks such as those for the synthesizer, frequency display, and high-pass and low-pass filters. The CPU itself is a type 6802. There would be no point in going into all the complex circuitry within the microprocessor and its associated blocks. For example, there are several complex PLL loops within the synthesizer. But, the general concept of control exercised by the microprocessor is interesting. It accepts tuning information from the main tuning knob via photo-choppers and senses if the tuning knob rotation is up or down. It also accepts tuning rate control information from switch settings. It then supplies this data to the synthesizer for frequency generation in 10 Hz steps and to the frequency display for readout to 10 Hz steps. When certain frequency limits are reached, it sends controls to diode switch in or out highpass filters in the receive signal chain and relay switch low-pass filters in the transmit signal chain. Frequency set information is stored for the two AIB v.f.o. 's in the KWM-380 during operation, and the two frequencies can be anywhere within the operating range of the transceiver. However, when power is turned off and then turned on again, the v.f.o. 's are always reset to 15 MHz. The frequency generation and control is arranged such that frequency coverage is continuous without any break for "bands." That is, if the fastest tuning rate is chosen, three revolutions of the tuning knob will completely set the transceiver on any desired frequency between 3.000.00 and 29.999.99 MHz (receive mode, transmit mode is limited to amateur band segments). The other selectable tuning rates are 200 kHz, 20 kHz, and 2 kHz for one main tuning knob revolution. Details of the transmit chain in the KWM-380. The basic modes generated are s.s.b. and c.w. For s.s.b. generation a d.s.b. signal is generated at 455 kHz in balanced modulator U501. The signal is then routed through the 2.1 kHz filter contained in the passband tuning circuit used on receive and translated again to 455 kHz as an s.s.b. signal. On transmit, a front-panel mode switch automatically sets the variable oscillator in the passband tuning circuit so a selected l.s.b. or u.s.b. signal is generated. In this manner, and considering the action of the passband tuning control on receive, one has independent control of sideband selection for transmit/receive. The 455 kHz s.s.b. signal is further frequency translated up to the final operating frequency by the same mixer/oscillator circuits active in the receive mode. The signal reaches the 100 mW level in broadband amplifier stage Q202-204 and is fed on to a power amplifier block. For c.w. operation, the 455 kHz carrier signal normally injected into the balanced modulator is diode switched into the 455 kHz i.f. chain preceding the passband tuning block. This 455 kHz carrier signal is also gated for c.w. keying by a diode switch, Q503, which is controlled by a pulse shaping circuit, U500C, which provides for controlled rise and decay times during c.w. keying. The c.w. keying circuitry also activates a sidetone oscillator feeding the microphone preamplifier stage. This is provided so the VOX circuitry can also be used on c.w. for receive/ transmit switching. The sidetone output is not used to generate a c.w. carrier. The VOX circuitry provides for separate "delay" control settings in the c.w. and s.s.b. modes. On both s.s.b. and c.w. the output level essentially can be adjusted for QRP levels to full output. On s.s.b. this is accomplished by control of the microphone amplifier gain and on c.w. by circuitry which directly controls the r.f. carrier level via controlled biasing of the a.l.c. loop. Metering provides for monitoring the a.l.c. level, using the same scale as for S readings on receive, and for direct reading of forward and reflected power levels as sampled at the output of the power amplifier. talk power and improve VOX operation stability. 2-88  Improve the upper angle viewing of display A10A1.